Last week, after putting Curly to bed early (Think: 10pm. I know, right?) I had a good half an hour before my brain would begin it’s shutting down process. More than enough time to do my nails! 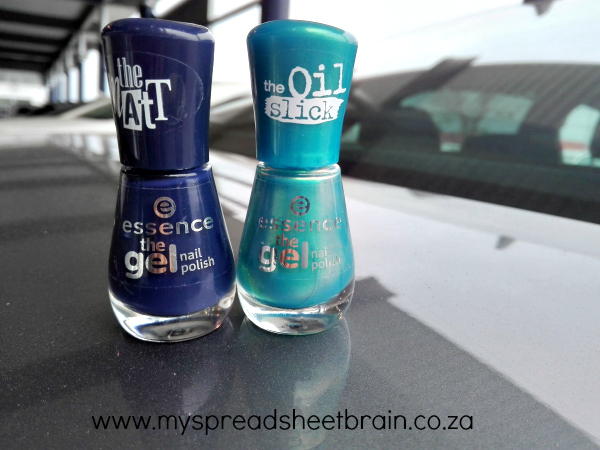 With no particular mani in mind, I applied my Essence Gel Look base coat and waited for that to dry. 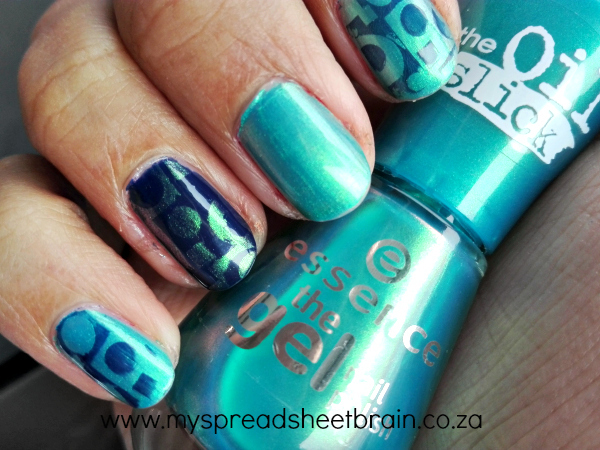 I then applied the wonderful Essence The Gel ‘The Oil Slick’ #29 Paradise to all my nails except both ring fingernails. How pretty is this color, ya’ll?! 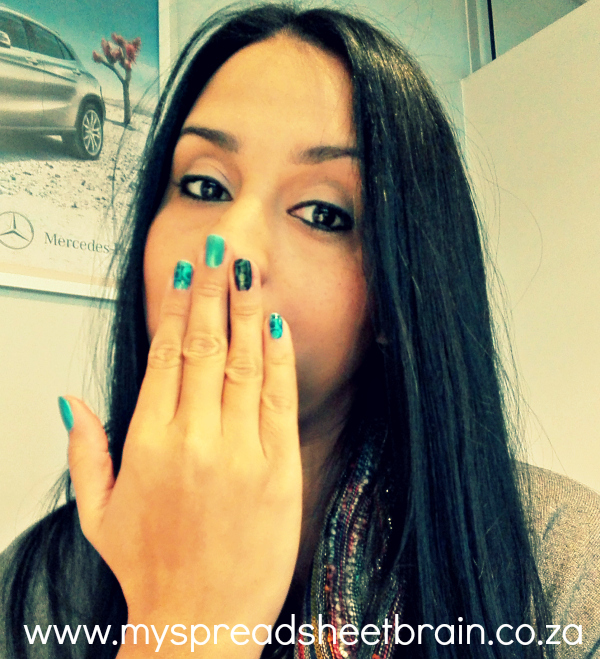 It’s super shimmery and its aquamarine hue reminds me of mermaids and the ocean and Cassie over at Amazeblog. (I think it’s coz of her favorite leggings). But anyways, I digress. 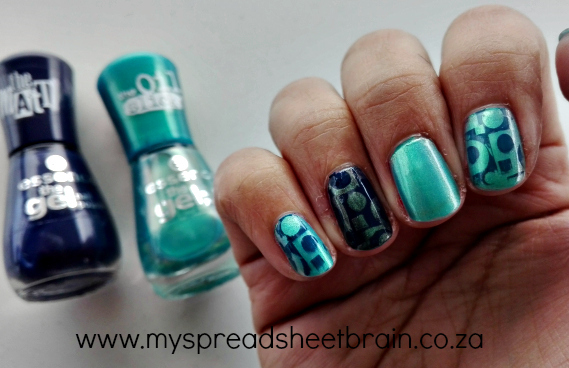 I applied 2 coats and then, once it was sufficiently dry, I used my The Polish Diaries stamping plate #M65 to stamp a funky image onto my nails, using another Essence fave: The Matte #22 I love my blue jeans. I think it came out pretty legit. Don’t you think? I painted my ring fingernails with 2 coats of The Matte #22 and stamped the same image onto those nails, using The Oil Slick. A bit of a reverse effect there. Top coat on and ta daa! DIY nail art in under 20 minutes. My kinda nail art. 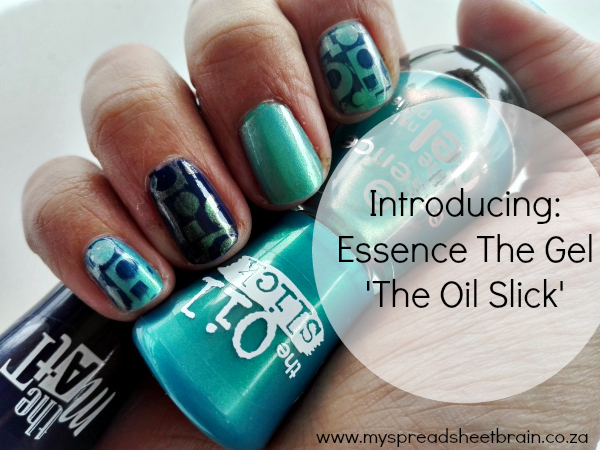 What do you think about the Essence The Gel ‘The Oil Slick’?